Mumbai/New Delhi: With rising crude prices still at half their record high, drivers in much of the world are still enjoying pain-free visits to the pump. That’s not the case in India, where diesel, the most-used fuel, is more expensive than ever before, and gasoline prices also are hovering around record levels in several cities. India lifted controls on diesel pricing four years ago, after freeing gasoline rates first. But with federal elections next year and several state elections in the coming months, the government is feeling the pressure to restore a lid on fuel prices. None of its options are particularly pretty. A big reason was to relieve the government’s massive burden to subsidize fuel. Subsidies had ballooned to $9.6 billion in the year ended 31 March 2014. About seven months later, subsidies on diesel were called off. State-run explorers Oil and Natural Gas Corp. and Oil India Ltd. and state gas utility GAIL India Ltd. also had been paying to subsidize fuel prices, to the tune of $10 billion, by selling crude and fuels to the state retailers at discounts. 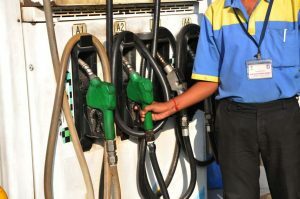 Making matters worse, the lag in payment of subsidies by the government messed up the finances of state fuel retailers Indian Oil Corp., Bharat Petroleum Corp. and Hindustan Petroleum Corp., which were forced to borrow heavily to bridge the gap between the selling price and their cost. It could slash fuel taxes, which account for about half the per-litre price people pay. But that would mean a major loss to government revenues. Excise duty and additional taxes are estimated to fetch the government about 2.5 trillion rupees in the year ending March 2019, according to the federal budget document. That’s 77% more than what it collected five years ago. For a government struggling to meet its fiscal gap goals, any reduction in taxes would stretch its finances. That’s why a second option—reinstating price controls, partially or fully—might be the easier route. The great global oil price slump of 2014 pushed prices below the levels set by the Indian government. So when India abolished price controls that year, local prices actually fell. The government made the most of oil’s continued tailspin by adding a tax on oil rather than passing on the entire reduction to consumers. With the tax still in place, Indians therefore felt the pinch doubly when oil prices started climbing again. On Tuesday, Brent hit $75 a barrel, the highest since 27 November 2014. Federal taxes on diesel were increased five times since September 2014, to 17.33 rupees a litre, before a 2 rupees-a-litre reduction last October. That cut, along with a reduction in gasoline taxes, were estimated to have reduced the government’s revenue by 260 billion rupees during the year ended March. Still, taxes account for more than half of the retail price of gasoline. On 19 April, the pre-tax gasoline price in New Delhi was 35.20 rupees a litre. It finally sold for 74.10 rupees a litre after adding taxes and dealer margins. Diesel accounts for about 40% of all oil products consumed in India, and it’s the most important fuel for public transport. Diesel also has a trickle-down effect on inflation: Higher diesel prices mean higher freight, and higher freight makes transportable goods more expensive. The price of gasoline, the primary fuel used by cars, affects a more affluent demographic. But it’s also a mass fuel, because almost all of India’s scooters and motorcycles run on it. So-called two-wheelers are mainstays of commuters in cities and rural areas.